For me, 2012 was particularly heavy. And I had a sneaking suspicion it would be at the end of 2011 when I felt the overwhelming conviction to pick the word patience as my word for 2012, though I desperately wanted to pick any other word that would signify light and fluffy. And though John joked with me that I'd have to own it again this year if I couldn't get a handle of waiting well, I knew that was NOT what God was whispering to me heart. In fact, during the past week, I've known a lot of what God wasn't whispering to me, but I was having such a hard time nailing down which word He was speaking to my heart as I pondered peace, joy, abide and grace without really totally feeling any of them in my core. It was only after two hours of quiet time today that my 2013 emerged. And when it did -- goosebumps, friends. Goosebumps. "Celebrate God all day, every day. I mean, revel in him! Make it as clear as you can to all you meet that you’re on their side, working with them and not against them. Help them see that the Master is about to arrive. He could show up any minute! Don’t fret or worry. Instead of worrying, pray. Let petitions and praises shape your worries into prayers, letting God know your concerns. Before you know it, a sense of God’s wholeness, everything coming together for good, will come and settle you down. It’s wonderful what happens when Christ displaces worry at the center of your life. Summing it all up, friends, I’d say you’ll do best by filling your minds and meditating on things true, noble, reputable, authentic, compelling, gracious—the best, not the worst; the beautiful, not the ugly; things to praise, not things to curse. Put into practice what you learned from me, what you heard and saw and realized. Do that, and God, who makes everything work together, will work you into his most excellent harmonies." Normally, in this life verse of mine, I key in on the part about not worrying but instead through praying and thanksgiving making my requests known to God. And, honestly, I still love that part. But this celebrate, this reveling stood out to me this read around. 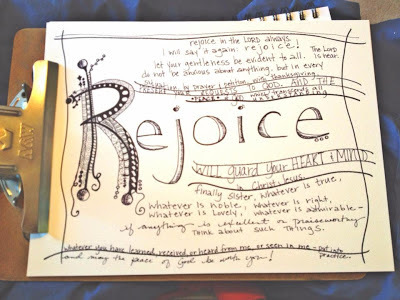 So I started digging into the word and found rejoice, and I dug even deeper and found the greek word, chairos, translates closely to "calm cheer." When I prayed and asked God what gift I could best give Him, my family and myself this coming year after a long, growing, character-building year, this word of rejoice, this "calm cheer" seemed perfect. When I think of rejoice I think of joy wrapped in peace, hope and harmony. And when I think of what I hope will fill our hearts and overflow from our lips in 2013, I can't think anything better than joy wrapped peace, hope and harmony -- in the good times and in the inevitable challenges. Welcome, 2013, I'm so glad you're here. But even more-so, welcome, spirit of rejoicing; we're so glad you'll be joining us. Visual prayer by Michelle. Contact her to do your word for 2013! I'm joining with a group of writers to go beyond making resolutions and instead picking a word to live by during the coming year! What a fabulous word choice! I hope the year is full of rejoicing for you and your family in all that you do. Thanks, Tracey! I'm so looking forward to it! I love this word! So much goodness and happiness comes just from saying it. I look forward to watching God rejoice with you. Oh, calm cheer sounds just about perfect. Here's to it! Uh oh. Now I'm going to choose puppy dogs or rainbows as my one word just to play devils advocate. Ha ha... But seriously. Rejoice is a fantastic choice! In fact I love it and I can't wait to rejoice all your miracles this year. Happy New Year, Friend!!! xoxoxo! I love this word. After the year you had last year, it sounds to me like courage and defiance - the courage to be a rebel to seek joy and celebrate the good, even when confronted with challenge. It bore fruit at the turn of this year, I hope it continues to bring bounty! Wow! The visual prayer is so striking. Great idea. Rejoice seems a fitting choice for you. You are so faithful in your commitment to rejoice in all things. Here is to a year of great blessings in which you will have much joy in which to rejoice.